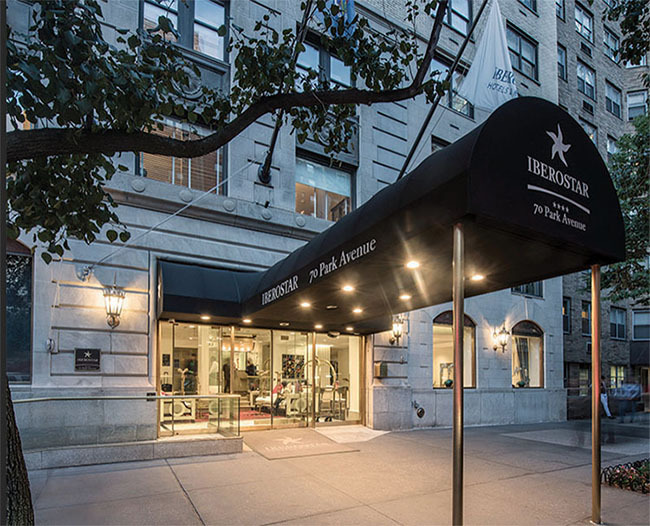 With a brand that is very familiar with South Americans and others from warmer climates, the Iberostar 70 Park Avenue in New York attracts visitors who are not used to the variable temperature in the Big Apple. In the shoulder months guests would often express their dissatisfaction about the climate in their rooms. “We have people from South America come to our hotel because they know our brand there, and they were unsatisfied that the room was too cold,” said Brenda Correa, general manager of the Iberostar 70 Park Avenue, which is located in a building constructed in the 1920s. Since Iberostar took over the property in 2016, guests who were too cold were given portable space heaters. “I was here since we took over and we bought a lot of portable heaters; I was so ashamed sending those things to the rooms because there was nothing else I could do,” said Correa. When discussing the problem with a general manager of another local hotel who had dealt with a similar situation, Correa got a recommendation for a product called PAFMAC. This product can use the existing two pipe fan coil system, while being able to provide heating or cooling, all year round. She contacted the company, Nippon PMAC, and they set up a trial run of units in two rooms for six months. Correa was able to convince her bosses, who were based in Spain, that the Nippon PMAC units were worth the investment when she had them stay in the rooms during the trial. “They came in the shoulder months when some days were very hot and others were very cold for them, being from Spain,” she said. “They approved it and we signed the contract.” The installation began in January of 2018 and was completed in June for the 17-story, 205-guestroom hotel. Now, guests have the ability to change the room temperature for cooling or heating, anytime of the year. This is possible because the PAFMAC can provide cooling using hot water and heating using cold water. “This is great because we have many guests who come from warmer climates such as Brazil, Argentina or even Mexico, and they have different temperature needs,” she said. Correa loves the fact that the new units are the same size as a fan coil and are silent. “The other units we had before would make lots of noise, like dinging or rattling,” she said. “Now there is no noise at all.” She said that a guest—who had previously requested two portable heaters in his room—has been back and immediately noticed the difference. Correa is extremely pleased with the results and wishes all of her vendors were like Nippon PMAC. “They were very honest. It is very nice to have that customer service,” she said.